You may have noticed that the silver and black are wearing pink this month. For the last few Octobers, the National Football League has teamed up with the American Cancer Society to highlight breast cancer awareness and raise funds for breast cancer research. 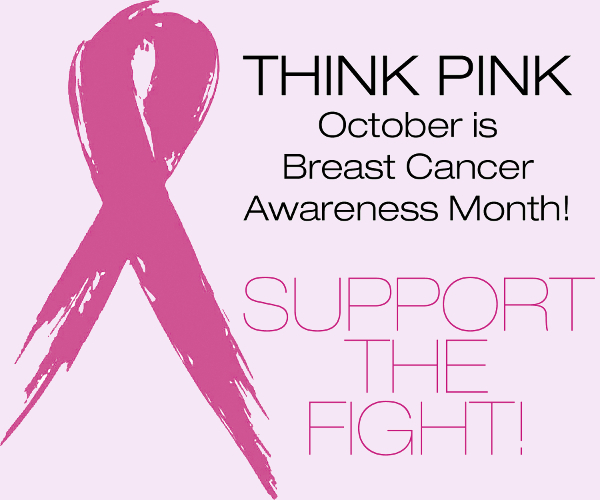 One in nine women will develop breast cancer. That’s 12% of the female population, and women make up 99% of the cases of breast cancer. Less than 1% of people with breast cancer are men, and a man’s chance of a breast cancer diagnosis is about one in a thousand. By definition, breast cancer starts in the breast. Theses abnormal breast cancer cells begin to grow uncontrollably and invade the normal breast tissue. It takes months, sometimes years, for enough cells to amass to be felt. A one centimeter lump contains about a billion cancer cells. As the cells grow they continue to directly invade their neighbors, but cancer cells can also float through the circulatory system. The most common place that breast cancer cells are found outside the breast are in the axillary lymph nodes. Let me translate that from medicine to English. Lymph is the liquid part of the blood, also called plasma. It slowly leaks out of the blood vessels from the capillaries and needs to be collected and returned to circulation. If lymph is not returned to circulation, we swell. If you ever looked at pictures of Elephantiasis as a kid (maybe it was just me) this disease is what happens when lymph does not return to circulation. In Elephantiasis, the lymph vessels become clogged and the lymph fluid become trapped in the legs. The legs begin to resemble elephant’s legs as the lymph fluid continues to build up and inflate the skin. What Are Lymphatics (Lymphatic Blood Vessels)? The lymphatic vessels are a third type of blood vessel, the first two being arteries and veins. Lymphatics are found throughout the body, including the breasts. Breast cancer cells can float through the lymphatic system and migrate to other organs. For cancer cells, this migration is called metastasizing. After a breast cancer lump reaches a critical size, the chances of a metastasis increases rapidly. This is why breast cancer awareness and early detection are so important. 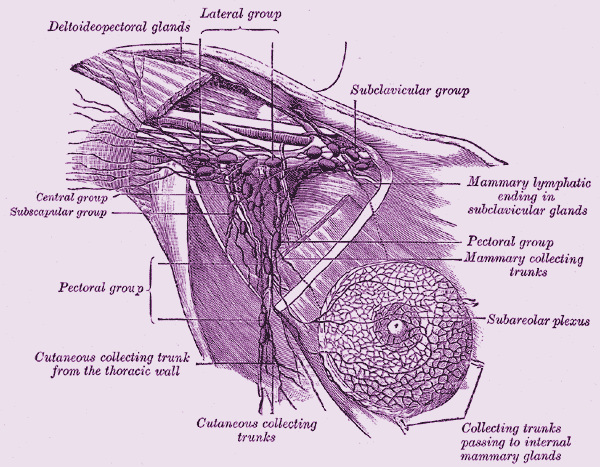 The breast’s main drainage system is through the axillary lymph nodes. Lymph is only fluid, so unlike other blood vessels, it is not normal to have a lot cells traveling through the lymphatic blood vessels. In fact, the body has filters along the lymph vessels, called lymph nodes, which trap unwanted cells, preventing them from moving freely throughout the body. The two types of undesirable cells that lymph nodes filter most frequently are bacteria and cancer cells. In both cases, the lymph nodes present the invaders to the body’s immune system, it’s police force if you will. When the immune system recognizes the invaders as bad, it kills them, and prevents any further invasion. This probably happens all the time without us being aware of it. Unfortunately, sometimes the immune system cannot handle the invasion, and the problem spreads. The majority of the lymph from the breast drains to the armpit (the axilla), so the most common place we find breast cancer outside the breast is in the lymph nodes of the armpit or the axillary lymph nodes. This is why checking the axillary lymph nodes is so important in staging breast cancer. No nodes involved (negative lymph nodes) is good, and means there is a higher chance that the cancer has not escaped the breast and thus a higher chance of curing the breast cancer. Breast cancer found in the lymph nodes (positive lymph nodes) are a worse sign, and often means additional treatment will be recommended to try and kill any cells that have escaped the breast. 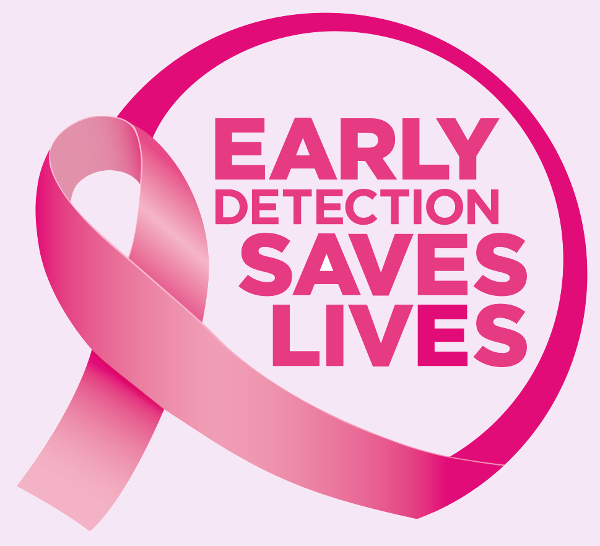 Why The Push For early Detection? If you understand how breast cancer usually spreads, then the emphasis on early detection becomes clear. The sooner breast cancer is detected, the smaller it is and the less likely it is to have spread. Small tumors found in the breast early can often be cured by simply excising them. Larger tumors will be more likely to require a mastectomy, but once the tumor has left the breast, surgery alone is not enough. Additional treatment is needed to kill the cells that have escaped. Unfortunately, the more cells that have escaped, the harder it is to cure breast cancer. The goal of breast cancer awareness and early detection is to find tumors when they are small are treatable and to prevent the larger tumor that cannot be cured. Since there is more than one cell type in the breasts, there is more than one type of breast cancer. The most common types of breast cancer behave as described above, the majority of the time. However, there are exceptions to every rule. For example, some less common tumors that arise in the breast spread directly through the blood stream, bypassing the lymphatics. Moreover, tumors that develop at the edge of the breast can directly invade the skin, muscle or bone of the chest wall. In every case though, the earlier it is detected, the better your chances of survival. If you don’t do monthly breast exams, I hope this makes you reconsider how such a small chore can prevent an enormous amount of suffering. What Can I Do About Breast Cancer? Awareness is the first step. Next comes action. Do your monthly breast self-exams, get your mammograms as recommended, and if you find something, don’t be scared, be proactive. Most breast lumps are not dangerous, cysts and benign fibroadenomas are the most common, but if you find one that is not benign, the sooner it’s identified the better your chances. Do it for yourself. For men, the most common breast lump is Gynecomastia. Early detection means you increase your chances of living a longer, cancer-free, life. If you want to help others there are many avenues available. The American Cancer Society accepts donations, which are used to accelerate breast cancer research, and many volunteer opportunities are available if you can spare a little time. If you want more information on how to get involved check out the Get Involved page on the American Cancer Society’s website.